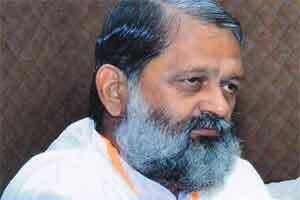 Chandigarh: Amid reports of swine flu in the state, Haryana Health Minister Anil Vij on Monday said that free vaccine would be given to all employees and doctors in all hospitals to ensure their safety from such diseases. About 150 cases of swine flu have been registered in districts of the state adjoining borders with neighbouring states namely Rajasthan, Delhi and Punjab, the Minister said. He said that there is information that eight patients suffering from swine flu had died during treatment in private hospitals, but no death has been registered in government hospitals across the state as a result of the quality treatment being provided there. Mr Vij said that the state government is committed towards ensuring good health and safety of people. Therefore, the decision to this effect has been taken and directions have been issued to the Director General Health department for immediate implementation of this decision. He directed all government hospitals to make arrangements of the adequate amount of medicines, diagnosis equipment and other facilities so that the disease could be stopped from spreading.